Everything can seem so overwhelming when you’re a new parent. Fear not, however! There are so many helpful tips out there with you in mind. If you haven’t thought about investing in a car seat mirror, for example, we’re here to remind you to do just that! Car seat mirrors are an absolute essential for new parents, as well as parents of older children. These miraculous, little mirrors allow you to keep an eye on your little one even when on the go. This most recent update features some of the newest car seat mirrors available on the market right now. We took into account FAQ from parents that we have encountered and added a section with these common concerns as well. So, what are car seat mirrors? Great, that’s what they are! On a more serious note, it’s like having a baby monitor in your backseat. It’s nice to have a sense of security while you’re driving. Parents of infants and even older children are able to view the activities taking place in their backseat This is especially comforting for rear-facing car seats, which most mirrors are marketed for. If you’re a new parent, you know that every little noise, or lack of noise, is cause for concern. Infants can have a variety of problems pop up out of nowhere. If your baby is in any sort of distress you’ll know right away! There are some studies that report them as being hazardous. However, most mirrors have a dual-strap system that keeps them firmly in place. There are also models with shatterproof glass, or acrylic glass, which makes them even safer. Some mirrors even attach to the rear-view mirror! These are targeted toward older children generally and are also handy for clearing up blind spots. There are so many different mirrors on the market, and we’re sure you’ll be able to find one to suit your every need. Just think about the peace of mind you’ll have when you can always see your darling little one smiling at you from the backseat! If you need a sturdy, wide-angle option, then this may be the perfect mirror for you. This model comes with a convex design that gives you a wider view of your little one. Combine this with the shatterproof design, and find your worries put to rest! This Sonilove model comes jam packed with a range of features that will suit almost any parent. One of the biggest concerns with having glass around a baby is breakability. You can rest assured that Sonilove has considered that in the design of this mirror. They used a shatterproof design that won’t break in the event of a car crash. Sometimes installation can be scary. This is especially true when you’re hanging a mirror right in front of your infant! This Sonilove model comes with great instructions that make putting it together a breeze. You’ll have it up, and ready, in no time! Sonilive really knocked it out of the ballpark. They designed this model with acrylic safety glass, which will keep your baby safe in an accident. On top of this, there is a lifetime satisfaction guarantee. This means that you can return it at any point for a full refund! No matter what life throws your way you’ll be fully satisfied with your purchase. Lusso Gear offers several key features in this product. This chic mirror comes in a black matte finish for an air of elegance in your car. The pivoting base rotates so that you can place it in exactly the position you need. While some mirrors may reflect a skewed image back at you, you’ll find whatever this Lusso Gear mirror reflects back is crystal clear! Ensure the safety of your infant with a fool-proof design. Lusso Gear creates this product with you, and your precious little one, in mind. With this mirror won’t have to worry about the dangers of your mirror slipping and falling. Have peace of mind knowing that it’ll stay exactly where it should! If you’re tired of warped reflections, then this mirror is a must have. You’ll be able to clearly see your smiling baby’s face whenever you look in your rear-view mirrors are made of low quality materials that can distend appearances. This is not the case with Lusso Gear! Lusso Gear made this car seat mirror both stylish and functional. Some children’s products can be obnoxiously colorful. This model offers a more polished take which will fit right into the decor in your vehicle. The large mirror, sophisticated style, and crystal clear reflections will leave you more than pleased with your purchase! It can be hard to find a better company than DaffaDoot. Not only do they make a quality product, but they also donate some of their profit! This large, clear mirror will help give you peace of mind. Whether you’re on a road trip, or just running to the store, you’ll never have to worry. It’ll also be satisfying to know that some of your money has gone to a great cause! Safety is the number one priority for DaffaDoot. The how nerve-wracking it can be to drive with an infant. To ensure that this mirror will be safe in the event of a crash, they made sure it was tested and certified. In fact, DaffaDoot challenges anybody to attempt and beat its crash-test results! That’s what we like to call pride in a product. DaffaDoot donates a portion of their profits to FIRST. This program allows children from grades K-12 to get involved in STEM through joining a robotics team. This program is world-wide and offers several chances at scholarships, as well as prestigious awards. If you’d like to know that your purchase is going to a new cause, then look no further. For those of you that would like to donate to charity, this is an excellent way to do so! Buy an item you need and feel good about your purchase. 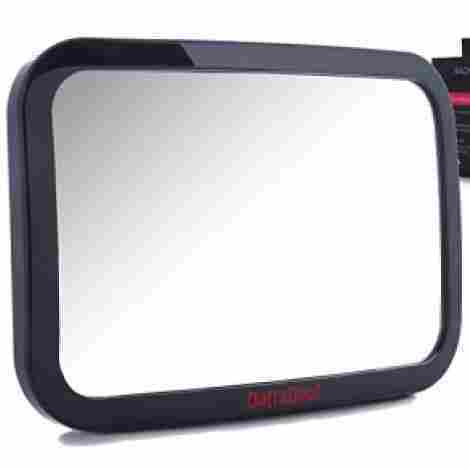 Daffadoot provides two options for setting up this mirror so that you can find your perfect fit! Their crash-tested rating offers every parent a level of security, as well. Feeling particular about your mirror’s placement? You’re in luck. There are two different ways to install this model! PNBB sends you a clip to attach the mirror to your visor. They also send you a suction cup if you would like to use your windshield instead. 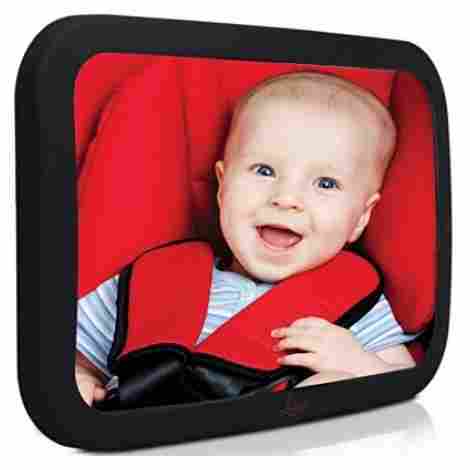 The wide-angle acrylic mirror gives you a large, but safe, picture of your little one from the back seat. This mirror is adjustable, affordable, and, most importantly, safe. The choice is yours! You can choose to install this mirror one of two ways. Either clip it to your sun visor for easy access or use the provided suction cup to place it on your windshield! This means that no matter what your car is like, you’ll be able to adjust your mirror until it’s just right. PNBB uses durable, quality materials to craft their products. This car seat mirror is no exception. The mirror is made out of a high-quality acrylic material, which means that shattered glass isn’t never a danger. This is important especially in the case of a car crash, where glass fragments could pose a safety risk. With two different installation methods and a shatterproof mirror, this product is sure to please. You’re able to get it ready right out of the box since PNBB provides all necessary tools for installation. The easily adjustable design offers a clear image of your child, and complete assurance while you drive. 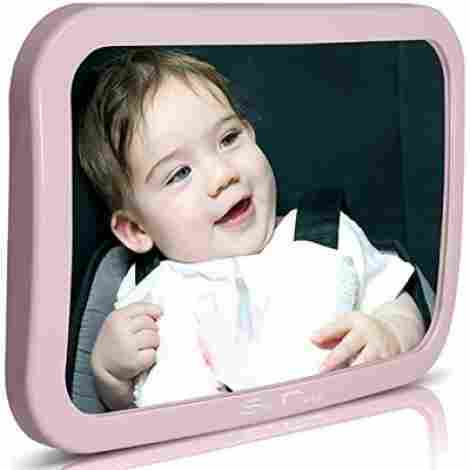 Cozy Greens offers an assortment of features with their car seat mirror. It’s ridiculously simple to install, has a great warranty, and allows your child to see you! Being able to see your face can bring great comfort to your little one. Cozy Greens also gave this mirror a minimalist design that will look lovely in any vehicle. On top of all this, they give to charity! What’s not to love? Don’t sweat it! This mirror comes easy to install, with absolutely no assembly required. You’ll be able to take it out of the box and have it up within thirty seconds! This means less time wrestling the product into place, and more time to spend with your baby. Worried you won’t like this mirror? Or concerned about wear and tear? No problem! Cozy Greens offers a full lifetime warranty so you can return it for a full refund! On top of this refund, Cozy Greens will also ship you another mirror- free of charge! A full lifetime warranty can put even the biggest concerns to rest. Whether you love it or hate it, you can be sure that you aren’t wasting time, or money, trying this car seat mirror out. This product also boasts a crash-tested rating, meaning they keep your safety in mind. Baby & Mom offers a unique casing on their model. They’ve also included a wide angle lens, to keep you in the know while on the move. It’s easy to set up, made with you in mind and cleans in a snap. For the first twelve months of your baby’s life, and then some, they’ll be in a rear-facing car seat. You can make those months worry free with a Baby & Mom mirror! The casing a mirror comes in is a vital part of its design. The choice of material ensures the mirror is secure, determines the durability of the product, and makes up most of the design. Baby & Mom offers a Polymer plastic casing that is super easy to clean and will last forever. Some mirrors only offer a narrow range of view. This is not the case for this Baby & Mom mirror! They use a wide angle lens that gives you an extra-large field of vision. No more guesswork as to what your baby is holding, or playing with! You’ll be able to see both their face and hands. With a light-weight design and durable casing, this car mirror is a perfect choice. Be sure that you know what is going on in the backseat, and have a good feeling while driving! Britax is a well-known company in the world of baby products! With such a famous name comes a certain sense of security. After all, if a company has such a good reputation then they must be doing something right! Britax specializes in well- constructed items that fit your day-to-day life as a busy parent. This back seat mirror is no different! The frame of this mirror is made with a soft-feel material that gives it a clean, polished finish. The velvety, gray material is definitely eye-catching! If you love a chic design, then look no further. Britax went the extra mile to ensure this mirror would be easy on the eyes. Britax .put a pivot attachment on this mirror to give you full control. This crucial part of the design allows this mirror to be positioned in pretty much any direction you would like it in. No more struggling with your mirror to focus on your baby’s face! Just use the pivot to focus on that precious smile. Value is the name of the game! 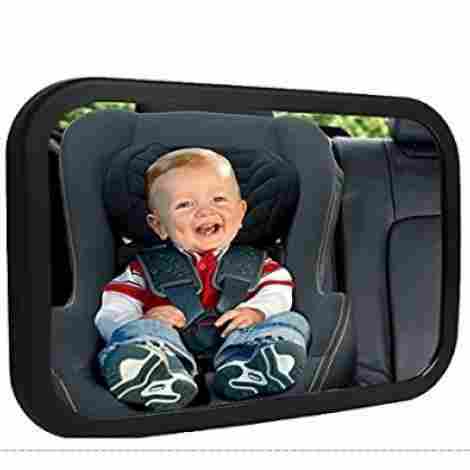 Britax offers a generous list of features with this car seat mirror to pack in bang for your buck. Even right down to the chic finish you’ll enjoy every inch this mirror offers. Enjoy the flexible pivot, wide lens, and sleek finish, while taking it easy on your wallet.. Finally, a product made for children of all ages! The Pikibu mirror is unique because it doesn’t attach to a headrest. Instead, this mirror goes right over your rearview, giving you a clear picture of your backseat. Keep an eye on what’s happening, whether it’s one child or a car full! This is a fantastic way to cover multiple bases at once. 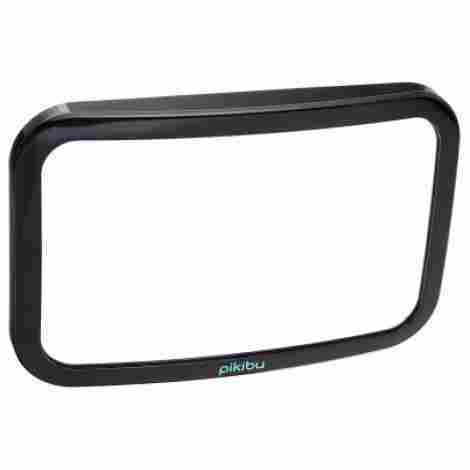 Pikibu designed this product to cover your rear-view mirror. This means it installs easily and gives you a much bigger view all around your car. Say bye-bye blind spots! Most mirrors are targeted towards infants. This is not so with the Pikibu mirror! We all know that children do not age out of mischief. In fact, the older they get, the bolder they are! This gives parents the ability to keep an eye on a child of any age, and especially on multiple children. Boasting an extra-wide lens, and a clever installation design, the Pikibu mirror is sure to satisfy. This product puts parents back in control, regardless of their child’s age! The extended mirror gives you a full range view of the area around your car, as well. Blind-spots begone! Find a simple design, and peace of mind, with this mirror by Baby Caboodle. The extra-large lens and adjustable view make this mirror perfect for any growing family. The mirror is held in a small, black frame which will blend into the upholstery of any vehicle quite nicely. It will also calm your anxiety to have a full view of your infant at all times! Fiddling with stiff straps can make your fingers pretty sore. Luckily, Baby Caboodle made sure their mirror came with easily adjusted straps that make the adjustment a snap! Slide the clips up and down with ease, and find your perfect fit. Tired of seemingly useless bells and whistles? Baby Caboodle created this product to be simple, and straight to the point. No more flashy features that just get in the way. This mirror is economical in the best possible way and will reflect your money savvy style. Your baby will be happier being able to see you, and you’ll be comforted knowing how he or she is doing. The simple design allows for more focus on the important part: your infant. Baby Caboodle even went as far as to survey parents about this product! The results were overwhelmingly in this mirror’s favor. Nobody knows value better than parents, after all! This company has earned rave reviews for their quality! The shatterproof glass allows parents to breathe knowing their baby is safe from potential harm. Acrylic glass is the best option for these mirrors, and So Peep definitely took that into consideration. The double-strap system also offers dual security, keeping this mirror permanently in place. Acrylic glass is shatterproof, and therefore the safest option to use. This car seat mirror also has an easily cleaned black plastic casing. Does your baby like to throw food or bottles? No worries! Even if it gets splashed, you can easily wipe away any mess. Who doesn’t love getting free stuff? Nobody, that’s who! That’s why it’s so cool that So Peep includes an ebook with every purchase. It’s a practical guide to your baby’s first foods and includes twenty nutritious recipes to try. Find new food, and find yourself feeling more secure in the car. You’ll definitely feel like you’re getting away with highway robbery! Not only is this mirror affordable, but you also get a bonus item. The materials used to manufacture it means that you’ll find this product durable, and dependable. The dual strap system keeps the mirror securely in place while you’re going about your day. Not to mention the glass, which doesn’t distort reflections. Have no rear-facing fear when your baby’s reflection is clear! Wow, that is a lot to think about! To be a new parent is to be full of love, joy, and, sometimes, abject terror. It’s just the way life is! However, we hope this list cleared some questions and concerns up. 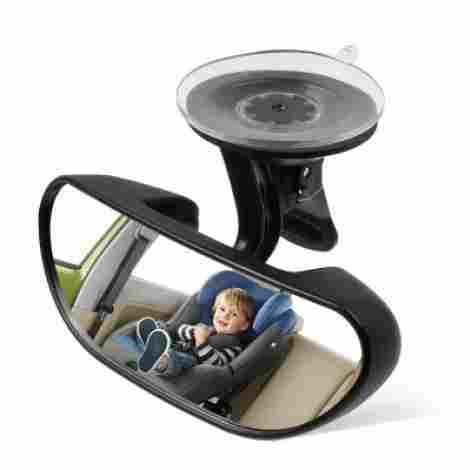 Car mirrors designed for babies and children are such an asset to any parent who uses them. They give you a clear picture of your precious little one with an unobstructed view of what they might be up to. This isn’t just useful for infants, however! Parents of older children can still find a variety of uses for these mirrors. It can be hard to not know what’s going on, especially once it gets quiet. We all know that’s when the trouble begins! Now, you know you can confirm your child’s behavior with a quick glance back without having to move your head to look behind you. There are multiple types to choose from! Each one comes with an assortment of pros, and cons. Some may be heavy and slip around too much. Others are bulky and aren’t compatible with every headrest. Always be sure to read the reviews, and keep in mind the potential flaws in a product. We’re confident you’ll find the right fit for you, however, now that you’ve read about so many great mirrors! Safety is always of the utmost importance when it comes to our babies. That’s exactly why we keep our little ones rear facing in their car seats for as long as possible in the first place. So, when it comes to products to make that easier, like car seat mirrors for rear-facing car seats, it’s important to continue aiming for that goal of keeping them as safe as we possibly can. All of the car seat mirrors on the list are designed with baby’s safety in mind and should pose no safety risk to your child when used appropriately according to the instructions of your car seat mirror’s manufacturer. These car seat mirrors are designed to be installed securely and are primarily made to be shatterproof so there is no risk of broken pieces causing injury to your precious baby. Going along with the theme of safety, we know that you expect nothing but the best materials to be used in the construction of products that are designed for your baby. Car seat mirrors are no different and we’ve made sure to create a list full of only the best car seat mirrors that are made of high-quality and completely safe materials. So many products nowadays are extremely complicated with lots of instructions that are difficult to follow and are cause more hassle than they are even worth. You want a product that you can use easily and quickly without any trouble. The car seat mirrors that we chose for this list are designed with that in mind. They are made to install easily with little to no trouble and adjustable ones are simple and easy to adjust as well. This one is obvious! Price has to play a role in any purchase decision you make. We know that you don’t want to throw your money away on low-quality products. We tried to include a range of prices when choosing the car seat mirrors for our list. However, more importantly, we looked at the value of the products that we evaluated. We chose car seat mirrors that are worth their price. The car seat mirrors on this list are made of high-quality materials designed with safety and ease of use in mind. Some of them even come with cool features or bonus gifts with purchase. If you want to know the truth about a product, the best people to ask are people who have bought and used the product you’re looking for. tI’s the best way to find out the honest truth about the quality and usefulness of a product. We made sure to look through review after review while making our list. We want nothing more than to provide you with the top-rated choices out there when it comes to car seat mirrors. As with any baby product, it is essential that you actually read the instructions thoroughly and make sure you know exactly what you’re doing. Safety is extremely important and the best way to keep your little one safe is to make sure that you install your car seat mirror correctly without the slightest bit of doubt. Follow all instructions and recommendations from the manufacturer of your car seat mirror. When you install your baby’s car seat mirror, you should be very careful to install it very securely. You don’t want the mirror to come loose in the car. If the car seat mirror were to come loose at just the wrong time, it could, in theory, hit your little one. There’s also the possibility that the car seat mirror would come loose and you wouldn’t be able to see your child. In the event of an accident, the car seat mirror may become a projectile and could injure your baby or someone else in the vehicle. By securing it well during installation, you can minimize that risk. Before you actually go out driving for the first time with your newly installed car seat mirror, you should sit down in the driver’s seat like you normally would when driving and check to make sure that the mirror is in a good position that actually allows you to easily see your little one. It would be annoying and disappointing to start off driving and glance into the mirror to find that it isn’t showing your baby but is instead showing the side of the car or maybe just the very top of your baby’s head. This is a quick and easy step that will save you some trouble. The way that a car seat mirror installs will vary from car seat mirror to car seat mirror, so for this reason, not all car seat mirrors will work on all vehicles. 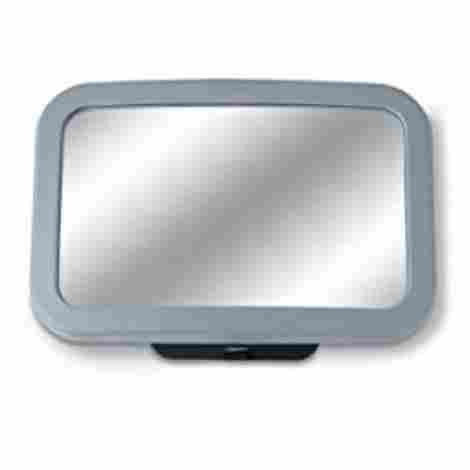 Many car seat mirrors work by attaching to the vehicle seat’s headrest. Since some vehicles don’t have headrests at all in the back seat, they won’t work with many car seat mirrors. Consider how and where a car seat mirror installs before purchasing and see if it will work well or at all with your particular vehicle. If your car seat mirror attaches to the vehicle headrest as most do, you will also want to check whether it requires an adjustable headrest or not to install properly. Some cars have adjustable headrests, while some headrests in cars are not adjustable. Many times, the car seat mirror requires an adjustable vehicle headrest as it attaches to the opening at the base of the vehicle headrest. Q: Does the type of car seat I have matter when choosing a car seat mirror? The type of car seat you have doesn’t matter when choosing a car seat mirror because the car seat mirror does not attach to the car seat itself. Instead, most car seat mirrors attach to the headrest of the vehicle seat. The only thing about the car seat itself is that obviously, you would want to buy a car seat mirror if your child is still rear facing since the purpose of the car seat mirror is to allow you to be able to see your child’s reflection in your rear-view mirror while you are driving your vehicle. Q: Can my baby see me in the mirror? The way that mirrors work is rather simple and as a general rule, if you can see someone’s eyes in a mirror, then they can see you as well. That means, as long as you can see your little one’s eyes, which you should definitely be able to if you install the car seat mirror properly, then they should be able to see you as well. This can be very helpful when driving because it helps your baby to stay calm. You should, obviously, only occasionally glance at your baby to ensure a safe driving experience for everyone, but your baby can watch you the entire car trip. That way, they always know that you are still right there. It helps them to be more aware of your presence and helps to keep them calm and happy. Basically, the car seat mirror won’t only provide you with much-needed peace of mind about the safety of your little one, but it will also help them to be calmer and will likely just make car trips all around less stressful for everyone. There is a little bit of debate about the safety of car seat mirrors. The car seat mirrors are usually considered safe, but some people point out the fact that they can become a projectile in the event of a crash. This is true that it is a possibility for that to happen, but not only is it unlikely that it will ever happen in the first place, but anything in the car can become a projectile in an accident. That goes for things like bottles, sippy cups, toys, and even your phone. Any unsecured object could become a projectile in an accident. So, your baby’s car seat mirror poses no more risk than your diaper bag in the event of an accident. Additionally, some people tend to worry that the car seat mirror could become a possible distraction while driving which would increase the chance of an accident occurring. This is an understandable concern, but if used properly, the car seat mirror should cause no problems at all. You should only be glancing in the mirror at your baby and you should only do so occasionally. Ideally, wait until a stop sign, red light or even stand-still traffic to look at and check on your little one. Q: Are they tested for safety? Many car seat mirrors are tested for safety in the same way that car seats themselves are tested for safety. That is, that the car seat mirrors are crash tested. This allows you to rest assure that the car seat mirror is as safe as possible and should hold up well even in the event of an accident. Q: Is it possible that the glass will break? The car seat mirror should be very securely attached to your vehicle seat and therefore should never come off or be messed with for any reason. However, even if somehow, something did happen and the car seat mirror came off, the mirror should not break. Most car seat mirrors are made to be shatterproof so that your baby is protected from the dangerous potential of broken glass pieces. Every car seat mirror is going to be somewhat different from other car seat mirrors. For this reason, it is important that you always read the instructions or manual that come along with your baby’s car seat mirror from the manufacturer. 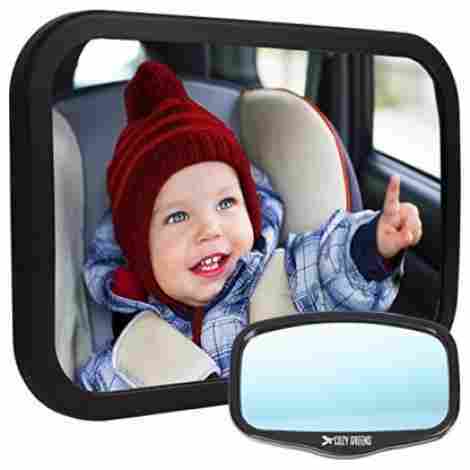 They know the product best and the information that they provide should give you everything that you need to know about the proper and safe way to install your baby’s car seat mirror inside of your vehicle. Q: Do I need any special tools in order to install it? No, you should not need any special tools to install your baby’s car seat mirror. They are designed to install easily without any kind of tools. Your car seat mirror should come with everything that you will need in order to install it into your vehicle. Q: How do I clean my baby’s car seat mirror? Car seat mirrors are very easy and simple to clean. They shouldn’t need to be cleaned very often at all since they should be installed outside of baby’s reach, but it’s easy to clean them when you do need to clean them. All that will be required most of the time to clean a car seat mirror is a quick wipe down of the mirror. If needed, you can usually clean a car seat mirror just using regular glass cleaner that you would use on any mirror or glass item in your house. Almost all car seat mirrors adjust in at least some way to make sure that they will work properly to allow you to see your baby in your rear-view mirror. Many car seat mirrors have the ability to fully adjust, though. Mirrors that can fully adjust are able to be turned to any angle up, down, to the right, to the left, or diagonally in any direction. You can certainly install the car seat mirror by yourself without any help. They are generally very easy to install as long as you read the instructions to make sure that you are installing it properly. However, it will probably be a lot easier and take less time to adjust the mirror into the proper position to see your baby well while driving if you have a second person helping you out. That’s because you can stay seated in the driver’s seat and look in your rear-view mirror to see if the car seat mirror is in a good position to allow you to easily see your baby while you drive. Then the person that is assisting you can adjust the car seat mirror according to your instructions until it is in the perfect position to allow you to easily see your baby. Q: Does the size of the car seat mirror matter? Most car seat mirrors are designed to allow you to adequately see your baby while driving. The size of the car seat mirror can certainly make a difference in how much of your baby you can see. The largest car seat mirrors allow you to adequately see most or all of your baby while you are driving. Even smaller car seat mirrors typically do their job well. However, if you have a bigger vehicle, your baby may be farther away from you in the vehicle. If that’s the case, you probably do want to go with a bigger car seat mirror so that you can see your baby well in it even from the larger distance in the vehicle. This will be especially true if you have three rows in your vehicle and your baby is in the back row of the vehicle. Q: Do I have to get one while my baby is still rear facing in their car seat? Whether or not you get a car seat mirror for your baby while they are in the rear facing position in the car is totally up to you. They are definitely very beneficial, however, and are definitely worth purchasing. Without purchasing a car seat mirror, you’ll have no way to see your child while they are rear facing and you are driving. Many parents are uncomfortable not being able to monitor their child during this time. Being able to see their child, allows parents to check that their baby is safe and sound and will allow them to be able to tell if their child needs them for any reason such as they are choking or something else along those lines. It can be especially helpful as your baby gets older because some toddlers are able to unhook themselves out of their car seats. This can be very dangerous, so obviously, you would need to know about it so that you could immediately stop the vehicle and fix their car seats. Q: What does it mean when a car seat mirror is convex? 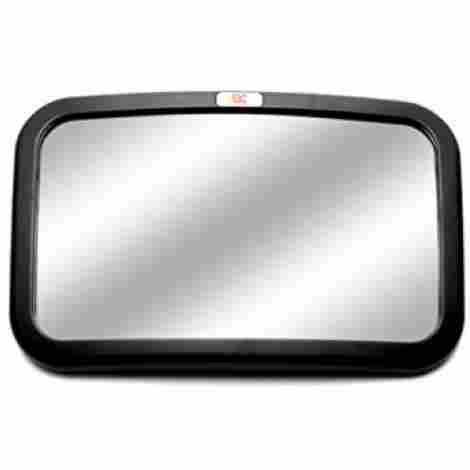 When a car seat mirror has a convex shape to it, it simply means that the car seat mirror is curved. The point of the curved shape of the mirror is to allow you to see more of your baby in the mirror. The mirror curves around your baby basically, which shows more of your baby in the same size car seat mirror that a flat car seat mirror wouldn’t show as much of. There you have it! The ten best car seat mirror products on the market today. When you go to make the best decision for you and your baby, the biggest deciding factor will be what type of car you have, and specifically, what your headrests look like. Most of these models work best with adjustable headrests, so be sure to check what your car has so that you are sure to get a model that will install properly and securely. There is not a wide range price wise, but some of these products are slightly more expensive, but keep in mind plenty come with free gifts so there is a pretty good value for the money.